Don't believe him, just watch. Boston Dynamics, the secretive firm behind the four-legged droid, released the video on Tuesday. If you thought humans were safe from the impending robot takeover on the dance floor, you might want to think again. In the minute-long clip, Spot can be seen stepping and moving almost perfectly in time with the music. He shimmies back and forth across the floor, while snapping his claw hand to the tune. At one point, he even twerks his rear-end up and down, then moonwalks. And in a testament to Spot's precise motor control, the robot performs his own version of the popular Running Man dance. 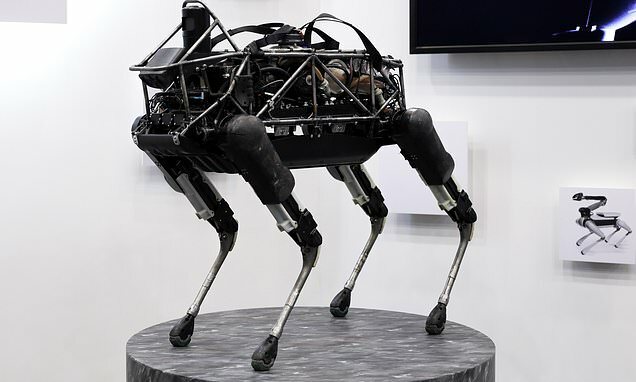 Spot Mini, which Boston Dynamics has teased for several years, is a more compact version of its larger counterpart, Big Dog. It's designed to last for 90 minutes on a single charge and can lift large items, navigate around obstacles, as well as open doors. Boston Dynamics said it hopes to have Spot up and running for a 'variety of applications' by the second half of 2019. The video comes just a few days after the startup published a new video showing how it put Spot to work. The clip shows the sensor-equipped device touring several construction sites. Spot has previously been shown navigating obstacles and climbing stairs with ease. But it seems the robotics firm is preparing Spot for use in the workplace. 'We have begun field testing the Spot robot for commercial usage around the world,' Boston Dynamics said. 'After an initial mapping run, Spot autonomously navigated two dynamic construction sites in Tokyo and used a specialized payload for surveying work progress.